Russia's Phobos-Grunt space probe suffered a debilitating malfunction shortly after its November 2011 launch, which stranded it in low-Earth orbit for more than two months before it succumbed to gravitational forces and plummeted through the atmosphere on Jan. 15. The $165 million spacecraft reportedly broke apart over the Pacific Ocean, but inconsistent reports soon surfaced, which sparked different theories about where the probe had landed, and what had caused it to malfunction in the first place. 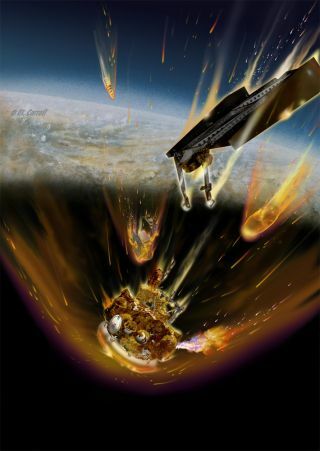 The Russian Federal Space Agency is notorious for closely controlling any information released, but part of the issue is the tricky nature of calculating re-entry predictions for dead satellites and other pieces of orbital debris. Still, the Phobos-Grunt saga was shrouded in mystery long before it crashed back to Earth. The cause of the spacecraft's malfunction has not yet been determined, and claims ranging from accidental radar interference to outright sabotage have been reported by Russian news outlets. Russian space officials suggested that strong emissions from an American radar station on an island in the Pacific Ocean could have accidentally interfered with Phobos-Grunt, reported the Russian news agency Ria Novosti. But, these claims were later dismissed by a Russian scientist who was involved with the development of Phobos-Grunt. Alexander Zakharov, a scientist at the Russian Academy of Science Space Research Institute, told Ria Novosti that the radar theory is "far-fetched," and suggested instead that issues with the spacecraft itself were likely to blame. American experts were also quick to write off the idea that a U.S. radar station could have been the source of the spacecraft's demise — accidental or otherwise. "I do not see any evidence that supports the suggestion that the United States somehow played a role in the failure of Phobos-Grunt," Brian Weeden, an orbital debris expert at the Secure World Foundation in Washington, D.C., told SPACE.com in an email. "I have examined the claims made about the U.S. tracking radar on the South Pacific potentially interfering with Phobos-Grunt and they are without any credibility whatsoever." Following Phobos-Grunt's fall from space, the Russian Federal Space Agency released an official statement confirming that the spacecraft had landed in the Pacific Ocean. But, the agency admitted this impact zone was based on orbital predictions, and they lacked tracking or visual data. "You're never quite sure," said Emmet Fletcher, Space Surveillance and Tracking Manager at the European Space Agency (ESA). "Eyewitness accounts are good, so if someone sees it coming in and takes a picture, that can tell you about where it lands. But, if you're fortunate and it lands in the ocean, which is where we like things to go, there shouldn't be anyone there. So, if something lands in the South Pacific, you won't have anyone there to observe it." Fletcher is part of ESA's Space Situational Awareness team which monitors space junk and operates a network of tracking stations. Fletcher could not comment specifically on Phobos-Grunt, but he has worked on coordinated international efforts to deal with spacecraft and orbital debris that has re-entered the atmosphere. "It's all a learning experience," Fletcher said. "There are lessons learned and conclusions about what we can do better. A lot of work is being done to standardize data." Right now, different agencies and organizations have different methods for calculating re-entry predictions. This has advantages and disadvantages, Fletcher said, but ultimately, a more standardized approach could help foster more efficient cooperation between entities. But the story of Phobos-Grunt doesn't end there. In a recent development, the U.S. military appeared to have removed links to Phobos-Grunt tracking data on a public website that ordinarily details such events. Information about the doomed Russian probe's re-entry was removed from Space Track, a website operated by U.S. Strategic Command. The military also did not publish any confirmation of the probe's fall, which breaks with standard protocol. This handling of the data seemed unusual, said Weeden, a former U.S. Air Force officer, who once also directed the Joint Space Operations Center's orbital analyst training program. "[T]he final re-entry prediction data is still missing from the U.S. military's website where they normally publish the information," Weeden said. "I do not really have any idea why they would withhold this information for Phobos-Grunt. They have published the full re-entry prediction data on three other space objects so far this year, and they are continuing to publish re-entry predictions as normal for the next object, Cosmos 2176, which is a Russian Kompass-2 satellite that is due to re-enter in the next several days. " But Friday evening (Jan. 20), a spokesperson from U.S. Strategic Command told SPACE.com that data was not, in fact, removed from the Space Track website. Rather, a human error had accidentally misfiled the information. "All actions taken during the Phobos-Grunt re-entry were designed to improve international data sharing on this event," Julie Ziegenhorn, Deputy Chief of Public Affairs at U.S. Strategic Command, said in an email statement. "Unfortunately, shortly after the re-entry event, there was human error that led to all Phobos-Grunt entries on spacetrack.org being misfiled into the year 2011 data, which made it difficult for customers to access the information. Shortly after the error was discovered, the information was re-posted to the site and is accessible at this time." Still, experts are hoping that more precise information about Phobos-Grunt's impact zone will be released, but it's unclear which agencies will make their reports available to the public. ESA plans to release a final report on Phobos-Grunt, but officials are currently still waiting for "additional data from non-ESA sources," agency spokesperson Andreas Schepers said in an email. The Phobos-Grunt spacecraft was designed to collect soil samples from the Mars moon Phobos and return them to Earth in 2014. The botched mission is one of several space failures that plagued the Russian Federal Space Agency over the past year. "It was one of the boldest cavalry charges, and they said it was a cavalry charge to restore Russia's honor in space," Oberg said. "But, cavalry charges can also wind up disastrously, so the use of that metaphor was particularly apt."